Over the years, the card games anime genre has grown to become its own thriving little sub-genre somewhere between sports anime and shonen battle anime. Series like Yu-Gi-Oh and Duel Masters have lit up our TV screens and created a craze across the globe. The evolution of card games anime has been long and rather interesting and with the next evolution upon us it becomes even more so. Move aside Yu-Gi-Oh because it’s time to stand up for Cardfight!! Vanguard! From the creator of Yu-Gi-Oh R and Duel Masters, Cardfight!! Vanguard has one hell of a pedigree or a card games anime. It has the right DNA for success and if this first part of the series is anything to go by, Cardfight!! Vanguard looks to be the next big thing. 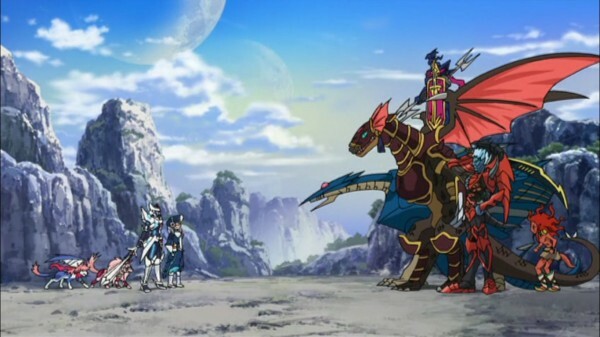 While it may come from the same mind that brought us Yu-Gi-Oh R and Duel Masters, this series has one major difference. 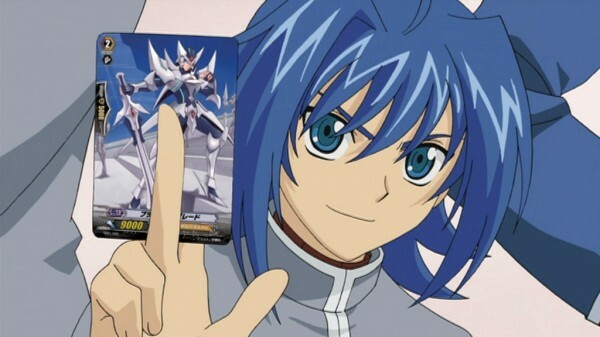 Unlike other card games anime which indulge heavily in the supernatural and magical, Cardfight!! Vanguard focuses and gives greater priority to its central card game, ‘Vanguard’. As the series progresses we come to learn the game alongside the series’ protagonist Aichi Sendou and it is truly refreshing to see the rules adhered to so realistically. The central card game of ‘Vanguard’ is a game simple enough to understand quite easily, but complex enough to have countless strategies and possible outcomes and scenarios. It is a damn near perfect card games system that is captivating in every sense. When the wheels of this game are in motion, you won’t want them to stop. The twists and turns a simple game can take is highly engaging and the possibilities are seemingly infinite, with no two games feeling the same. 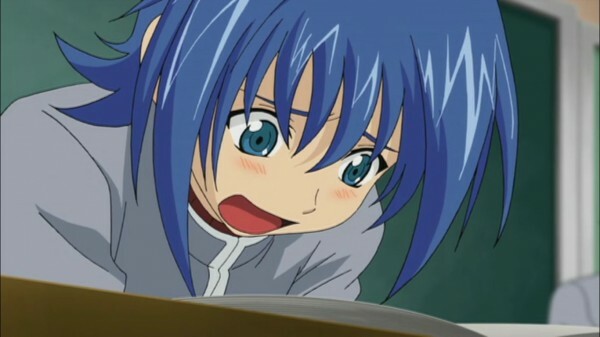 It is easy or the viewer to understand Aichi’s fascination with the game and the series treats it as an alluring one at that. This first season of Cardfight!! Vanguard covers the ‘Card Capital Arc’ and begins the ‘Regional Tournament Arc’, the first of which makes up for the bulk of this release. 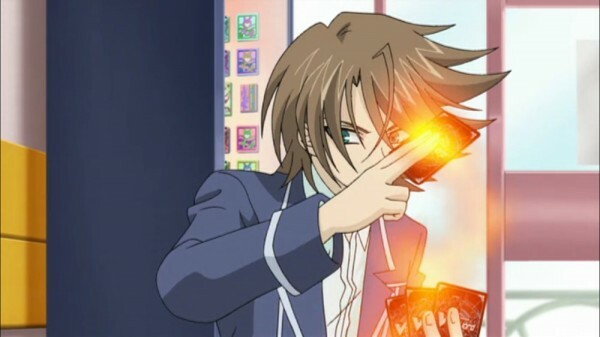 The ‘Card Capital Arc’ follows Aichi as he learns the game and competes against and ultimately befriends other cardfighters at the local Card Capital shop. It is here that we are introduced to the main cast and the personalities of each. Most interesting of all is the growth we see in Aichi. After his fateful encounter with perennial rival Kai, Aichi slowly but surely grows to become a more confident person, gaining friends and improving at cardfighting. The real strengths of Cardfight!! Vanguard are its brilliantly detailed card game system and its realistic and down to earth approach to the card games concept. It handles it with care and ends up coming off as highly relatable to anyone who has played card games at one point or another. While there is magical monsters clashing, it is never the main attraction. The real highlight here is the strategic plays and match ups that are both intelligently written as well as richly detailed and explored. Cardfight!! 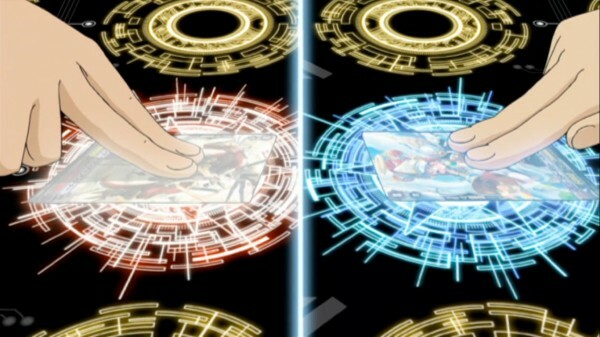 Vanguard is the next evolution in the card games anime genre. It takes the genre is a great new direction and what lies ahead looks like more and more fun. Isn’t that what it’s all about really? Fun. The aesthetics of Cardfight! 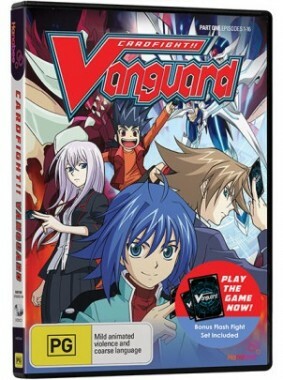 Vanguard are pretty simple, there isn’t anything really ambitious about this series’ artwork. It does the job, but doesn’t exactly create a memorable look. While some of the character designs are quite unique, a lot of the cast are very familiar and the art and animation generally feels like your standard TMS Entertainment job. It sadly just doesn’t leave much of an impression in its visuals, but there is always room for improvement as the series progresses. As for the soundtrack, the series features an awesome ‘engrish’ romp from JAM Project as its opening theme, which manages to stir up a measure of excitement as it opens each episode. The incidental music is quite good in its own right as well, with a number of noteworthy tracks standing out. This release features both English and Japanese audio which is always a plus. The English language dub comes from Ocean Group and is an all round quality effort with a number of highlight performances. I’d recommend the English dub over the Japanese original for its humour alone, which really can summon up a big laugh more often than you’d imagine with its witty dialogue and performances making the English version stand on its own from the Japanese version. In what may very well be one of the greatest bonuses in an anime release in quite some time, Hanabee Entertainment have gone above and beyond and included a flash starter pack of actual ‘Vanguard’ cards in this release. Not only do you get 50 free cards, featuring cards from Kai and Aichi’s decks, you also get two play mats, a rule book and information on where to purchase more cards. It is a bit of genius really. Because of these bonus cards, Hanabee’s release of Cardfight!! Vanguard part one ends up being a brilliant entry point or both the anime and card game. Fun is an under appreciated commodity in this day and age. Too much attention is given to the gritty and dark dramas, that simple down to earth fun like Cardfight!! Vanguard gets lost in the shuffle. This is a series that is fueled by fun and sends it into your eyeballs, all through your nervous system and ultimately to the part of your brain the registers enjoyment. Cardfight!! Vanguard is just flat-out fun and if you’re willing to give it a go, you may just find yourself swept up in its sway. Hanabee’s Cardfight!! Vanguard Part One is a great way to jump into the series and the card game itself. You’ll get 16 episodes of quality entertainment and enough cards to battle it out with your fellow cardfighters. Cardfight!! Vanguard has that intangible something called ‘heart’. Whether you’re into card games anime or not, this is a series that anyone can enjoy and if you give it a chance you may just find yourself addicted to this fun little anime and its heart.